It’s hard to tell from the image, but this hat has a lovely fabric, which is due to the extended single crochet. It’s a beautiful texture that’ll be great in both men and women’s hats. With that said, this pattern is designed to fit women. And the great thing about this hat is that it’s perfect for keeping your ears and forehead warm on cold winter days, while at the same time blocking the sun from your eyes. As you can see from the image above, it’s a nice length, but if you’d rather have it shorter, you can easily adjust that by reducing your number of rounds. See the note within the pattern. 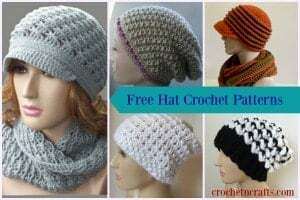 And, if you crocheted it in a cotton yarn, you might also be able to wear this in the summer. The fall winds are upon us… so keep warm. Gauge: Measures 1.5″ over first 2 rnds, and 1″ over 3 sts. Finished Size: Lying flat it measures 10.25″ across and 7.5″ high not counting the brim. Rnds 10-23: Rep rnd 9 until you have reached a desired height – This hat is fairly long, so go less if you’d like it shorter. One tester ended hers at rnd 19. FO. Row 1: With Right Side facing, Join yarn with sl st to 23rd st from where you fastened off. Ch 1, 2 sc in next st, (sc in next 2 sts, 2 sc in next st) 6 times, sl st into next st. Turn. 26 sc. Row 2: Ch 1, skip the sl st, 2 sc in first sc, sc in each sc across, skip the sl st, working into the hat, sc into next sc of hat, sl st into next st of hat. Turn. 28 sc sts. Rnd 7: With Right Side facing, Ch 1, rsc evenly around; join with sl st in first rsc. FO. For a cowl to match, simply ch as many as you like and join with a sl st. Then repeat rnd 9 working 1 esc into each ch/st. 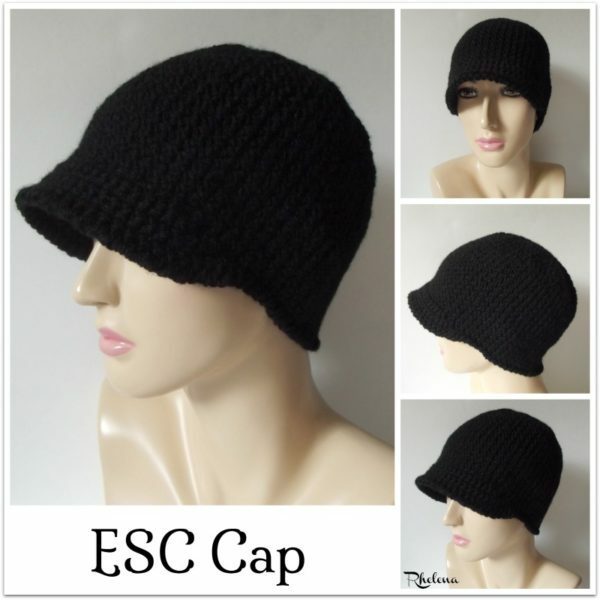 I would love to make a felted version of the ESC Cap! Anyone know how to figure what the increases would be? Or maybe a similar pattern already written for felting? Tried it and love it! Works up quick! Did 2 hats in one day and I’m not fast at crocheting.